An unknown World War I officer, depicted in a painting, has been identified by the website Art Detective. The picture was in the collection of Carmarthenshire Museums in Wales. 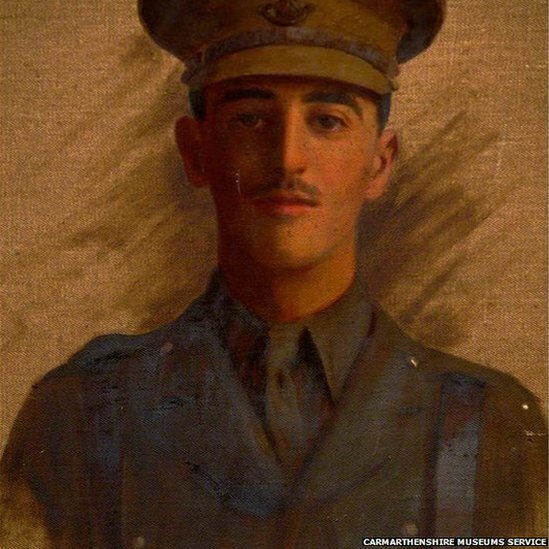 It depicts Second Lieutenant Paul Chancourt Girardot of the 2nd Battalion, Oxford & Buckinghamshire Light Infantry, whose mother lived at Carmarthen. Girardot was an only child who had lost his father aged just seven. He had been educated at Cheltenham College before joining the army in early 1914. He was killed in an an artillery bombardment, alongside many of his platoon, on 16 September 1914 at Soupir in France. The battalion had lost two other officers the previous day; 22-year-old lieutenant Hugh Mockler-Ferryman, from Tavistock, Devon, and 27-year-old lieutenant Reginald Worthington of Kidmore, Oxfordshire. This entry was posted in News, Soldiers of the Great War. Bookmark the permalink.